Annie was born in October 1876 (birth certificate number 1876/17092 – surname spelt Stannaway) in Helensville in the southern Kaipara region. Annie Stanaway – Helensville Museum. The first record we have on Annie is in 1900 from the Electoral Roll, we have Annie living in Helensville and working as a clerk. The Electoral Rolls from 1905 through to 1911 have Annie working as a clerk but now in Mangawhare. From 1914 through to 1928 she is living at Mangawhare & Dargaville and is listed as a spinster. In 1933 at the age of 57, Annie marries a widow Thomas Henry Geraghty (Marriage certificate number 1933/9680) in Auckland. The 1935 and 1938 Electoral Rolls have Annie living at 183 Church Street, Onehunga, this was her husbands house. On 10 March 1942 Thomas dies – he is buried in the Waikaraka Cemetery in Onehunga area W4 plot 41. It apears that Thomas was a member on the Onehunga Council (Auckland Star 12 March 1942) he died in office. T. H. GERAGHTY The death has occurred of Mr. Thomas Henry Geraghty at his residence, Church Street, Onehunga, aged 71 years. 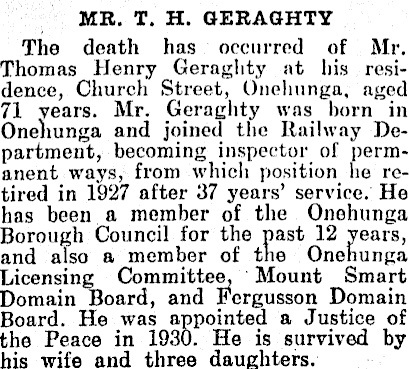 Mr. Geraghty was born in Onehunga and joined the Railway Department, becoming inspector of permanent ways, from which position he retired in 1927 after 37 years’ service. He has been a member of the Onehunga Borough Council for the past 12 years, and also a member of the Onehunga Licensing Committee, Mount Smart Domain Board, and Fergusson Domain Board. He was appointed a Justice of the Peace in 1930. He is survived by his wife and three daughters. Annie seeks an increase in provision – New Zealand Herald 6 March 1943. An application under the Family Protection Act was made by a widow, Mrs. Annie Geraghty (Mr. Hubble), before Mr. Justice Callan yesterday. The applicant sought increased provision from the estate of her late husband, Thomas Henry Geraghty, of Onehunga, who died on March,10, 1942, leaving an estate now valued at about £3500. 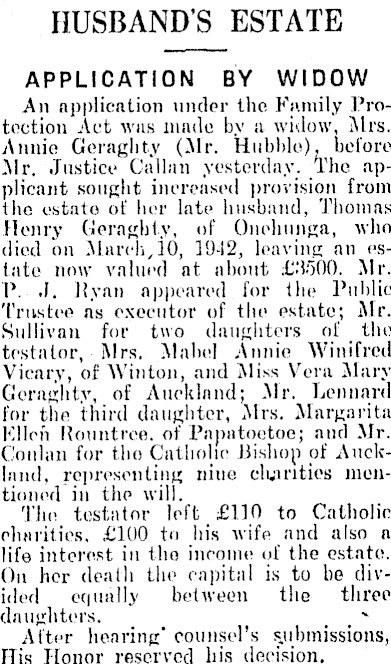 Mr. P. J, Ryan appeared for the Public Trustee as executor of the estate; Mr. Sullivan for two daughters of the testator, Mrs. Mabel Annie Winifred Vicary, of Winton, and Miss Vera Mary Geraghty, of Auckland; Mr. Leonard for the third daughter, Mrs. Margarita Ellen Rountree, of Papatoetoe; and Mr. Conlan for the Catholic Bishop of Auckland. representing nine charities mentioned in the will. The testator left £110 to Catholic charities, £100 to his wife and also a life interest in the income of the estate. On her death the capital is to be divided equally between the three daughters. After hearing counsel’s submissions, His Honor reserved his decision. From 1946 until 1957 the Electoral Rolls state Annie has moved to 218 Church Street, Onehunga. On 29 May 1962 aged 85 Annie passes away. 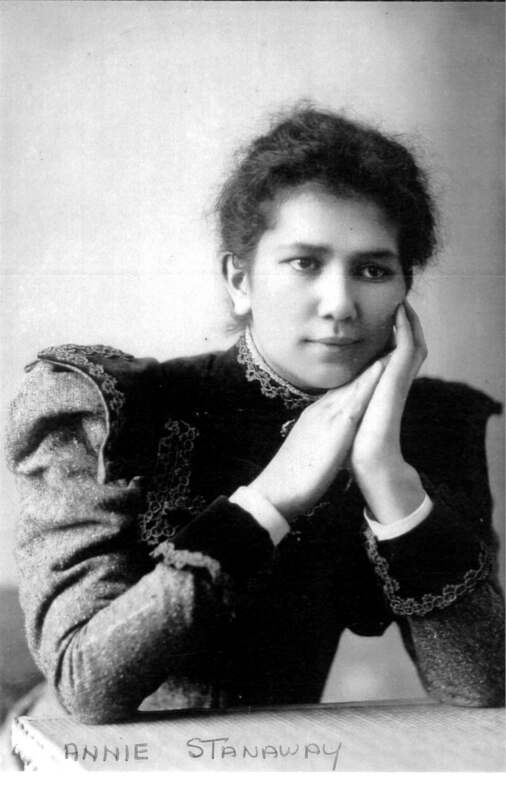 She is buried in the Waikaraka Cemetery in Onehunga Area W4 plot 235.